I wanted an enjoyable, entertaining read to while away a long train journey, so opened this up. Would it sufficiently draw me in and take me away from the over-enthusiastic air conditioning? 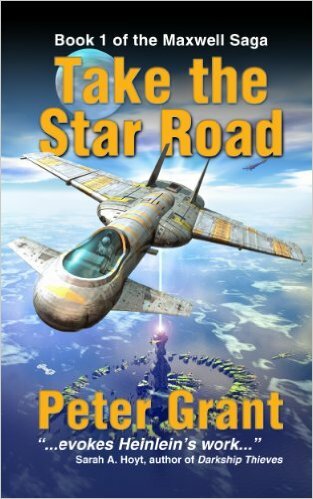 This coming of age book takes young Steve from his job as a busboy to managing to get a berth on a merchanter off Earth. I enjoyed the world and Steve's gritted determination to succeed no matter what. Grant clearly has spent a great deal of time fine-tuning his world, which mostly works well. While the writing style isn't particularly smooth and at times the dialogue clunks, there is nevertheless an engaging charm about this book that meant the obvious flaws in the writing was more than compensated by the conviction and energy Grant displays. The good news is that as this is the first book in the series, the writing should steadily improve. Steve's progress is down to his hard working, intelligent approach, though there were a couple of times when I would have liked to see him falter or just majorly mess up. He teetered on the edge of being a male Mary Sue by about two-thirds of the way through the book, but Grant at least rectified that somewhat by the end. However, the chirpy, can-do tone of this book makes it an enjoyable read -- and also provides a very readable contrast when things do kick off and get violent. The action scenes are handled well and this is when Grant's writing comes into its own. When I finally arrived home last night, I was sufficiently hooked by the story that I stayed up waaay later than I should to discover what would happen next. While this book isn't without its issues, I enjoyed it and will be looking to read the next one in the series.